Jane Hayes is a seemingly normal young New Yorker, but she has a secret. Her obsession with Mr. Darcy, as played by Colin Firth in the BBC adaptation of Pride and Prejudice, is ruining her love life: no real man can compare. But when a wealthy relative bequeaths her a trip to an English resort catering to Austen-crazed women, Jane's fantasies of meeting the perfect Regency-era gentleman suddenly become realer than she ever could have imagined. Decked out in empire-waist gowns, Jane struggles to master Regency etiquette and flirts with gardeners and gentlemen;or maybe even, she suspects, with the actors who are playing them. It's all a game, Jane knows. And yet the longer she stays, the more her insecurities seem to fall away, and the more she wonders: Is she about to kick the Austen obsession for good, or could all her dreams actually culminate in a Mr. Darcy of her own? I have only just moments ago finished Austenland and I am still in its lovely bubble. I feel euphoric actually. Like I have taken a drug and don't ever want to stop. Shannon Hale is a master writer. Not to mention she is hilarious. Bravo to her. I don't know how she did it? How did she make me feel like I was seconds from getting my first kiss. You remember the feeling? You're feeling lightheaded, butterflies are going rampant in your stomach, and your breath is quickening. Yet, you are holding it for fear the moment will pass without you having that special kiss you long for? I remember that feeling, and it is in full glory throughout this book. I think I felt breathless for more than half of the book. I think this is the feeling, the reason, we women are addicted to all things Jane Austen. No need for smutty details in books, the light touch of his hand on the small of her back was enough to get me going! I can not adequately express how much I enjoyed this book. I was fully engrossed in every page, and I think I'm going to have to have me a Jane Austen movie fest with the baby today. I'm in love with Mr. Nobely as much as I am in love with Mr.Darcy, and that is hard to do! The dedication to the books read: "For Colin Firth: You're a really great guy, but I'm married, so I think we should just be friends." Isn't that hilarious!! Ha! My sister Amy said her dedication would read like this: "For Colin Firth, I'm already married, but I'd give it all up for you! Call me!" 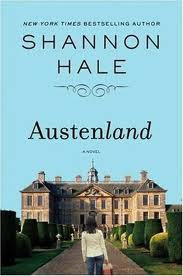 Austenland is currently being made into a movie starring Kerri Russel and JJ Fields. Produced and financed by Stephenie Meyer. LOVE! I can't wait to see it! It was Mr. Nobley with coat, hat, and cane, watching her with wide eyes. Jane took several quick (but oh so casual) steps away from Martin's window. "Um, did I just say, 'Ya'?" "You just said 'Ya,'" he confirmed. "If I am not mistaken, it was a battle cry, warning that you were about to attack me. I, uh..." She stopped to laugh. "I wasn't aware until this precise and awkward moment that when startled in a startled in a strange place, my instincts would have me pretend to be a ninja." I wasn't the biggest fan of the book, actually. But I am ECSTATIC about this cast!!!! Oh I just adored it! I had a butterfly in my stomach the whole time! I just can't wait for the movie! Midnight in Austenland comes out at the beginning of next yr. I can't wait!